03/06/2011 a photo by roostercf on Flickr. I haven't been working on a whole lot lately. Mostly trying to clean up the fiber that is all over my living room, as my knitting and crocheting group just did an exchange/donation night and is planning another for June. And I've filled another bag with fiber to go already, and I've realized I have entire plastic crate of fabric, too. How crazy is that? I don't even collect fabric and I've got a crate full. 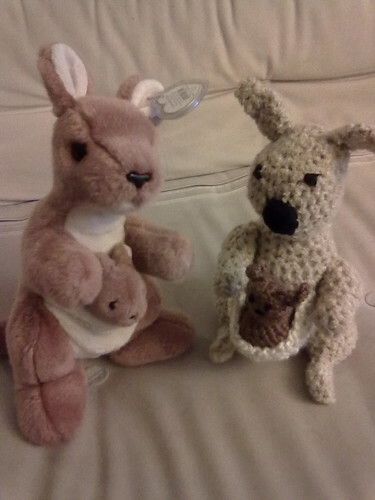 Anyway, the kangaroo above is a test crochet of a darling project by Elizabeth Harac along with her new friend Pouch the Beanie Buddy. I apologize I can't link to her work as her designer page on Ravelry is not set up for outside viewers. If you are a ravelry user, look for eharac. So I apologize if I haven't been very active lately. My designer mojo is at a low, so I have been focusing on getting my stash in order, cleaning up other parts of life, etc. I haven't even been working on my genealogy files much as I've been trying to get that mess cleaned up as well.